International youth day is celebrated to draw young people’s attention towards cultural and legal issues surrounding youth. It is an awareness day designed by United Nations on 12 August every year. Every year it is celebrated to bring awareness of the World Programme of Action for Youth. Every year a new theme is promoted to help the government to draw attention to the youth issues around the world. UN declares a theme for the year that communicates the scope, objectives, and direction of the year’s youth initiatives, such as “Change Our World.” for IYD. International Youth Day 2017 theme is “Youth Building peace.” The adoption of Security Council Resolution 2250 in 2015, there is rapid growth in recognition as agents of change, young people are critical actors in preventing conflicts and supporting peace. Todays International Youth Day 2017 is dedicated to young people’s contributions to avoid conflicts as well as inclusion, sustainable peace, and social justice. The Former UN Secretary General Ban Ki-Moon has said: “Youth should be given a chance to take an active part in the decision-making of local, national and global levels.” all persons between the age group of 15 and 24 are known as youth. IYD is celebrated through events, seminars, and programs from the local level to international level. 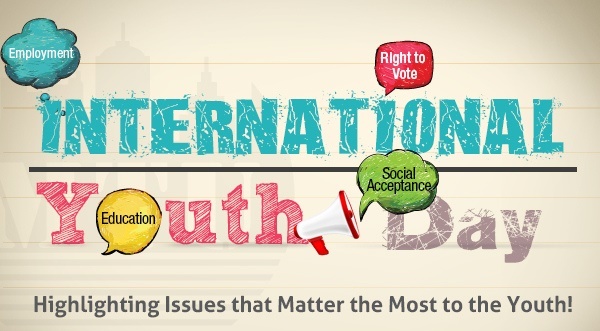 Many activities and events take place all over the world on International Youth Day. They are many activities like parades, sporting events and Mobile exhibitions that are helpful to showcase youth achievements. Educational Radio Show: carry out programs on radio stations by requesting them to give a slot and discuss various matters with youth. Organizing public meeting or debate: Organize a public meeting or keep round table discussions young people contribute to global issues. Host a youth forum to exchange ideas and discuss culture backgrounds to help young people accept others and popularize non-violence. Organize an exhibition by taking some space and keep awards of Young people who won in various activities their achievements and promote how they came up in their lives and discuss some issues regarding youth. Write to your Minister of Youth inform him or her about the challenges they faced in the society or in their life to suggest solutions.